We didn't head out right away as planned as activity remained in inaccessible country SW of Grafton, and too far to drive, and I was certain that strong storms would develop and head up to our area near Lismore anyway. From about 3.30pm some more organised convection was gathering strength and heading off the mountains, so we soon took off on chase. I picked up Dave from Wollongbar (5 minutes drive away) then we drove to the lookout at Tregeagle (SE of Lismore) to survey the situation. 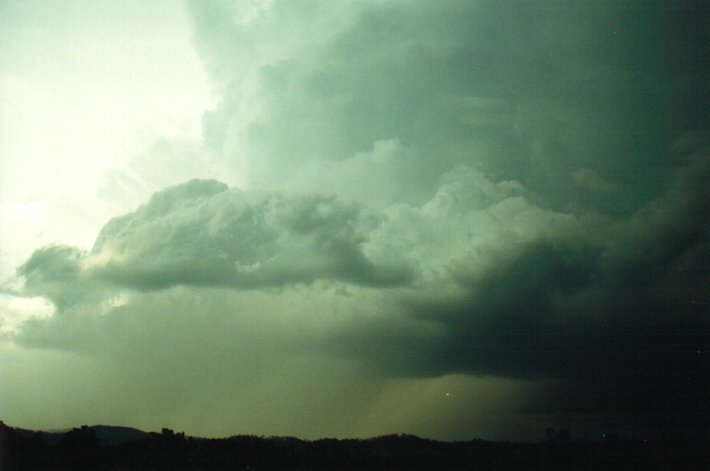 It was obvious a decent storm was way down to the south, about 100 kilometres away near Grafton, but the hazy conditions made it hard to pick out features. 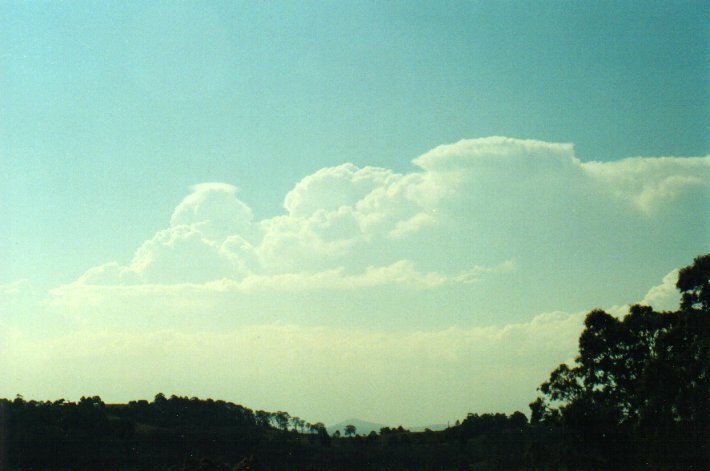 A good sign was the cumulus congestus that shot up in front of this about 50 km away, and another cell developing to our WNW probably W of Kyogle on the Richmond Range or thereabouts. 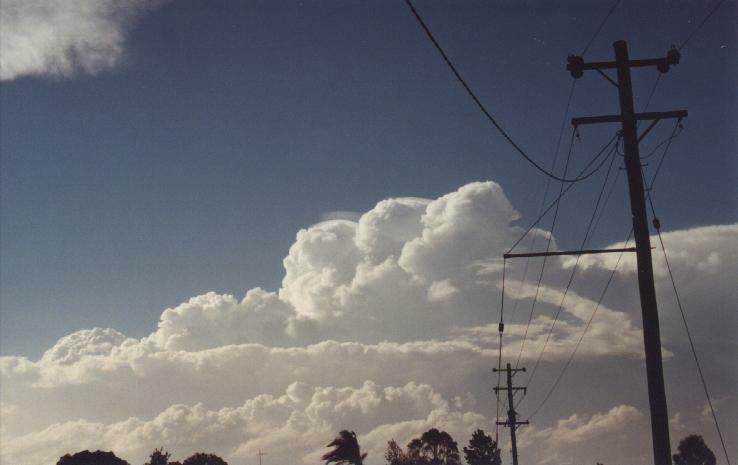 Every new updraft on this cell was capped with pileus indicating very strong uprafts, but at the time I was annoyed suspecting this would just continue up to the Border Ranges and into Queensland. 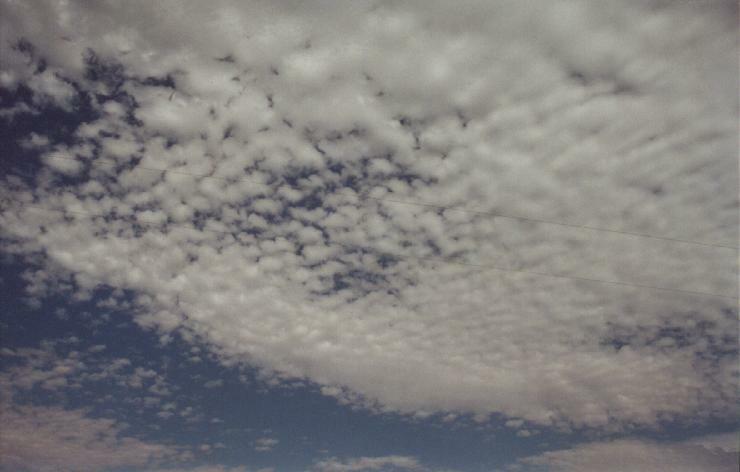 While we were at Tregeagle a field of altocumulus formed overhead and quickly developed into altocumulus castellanus (accas). 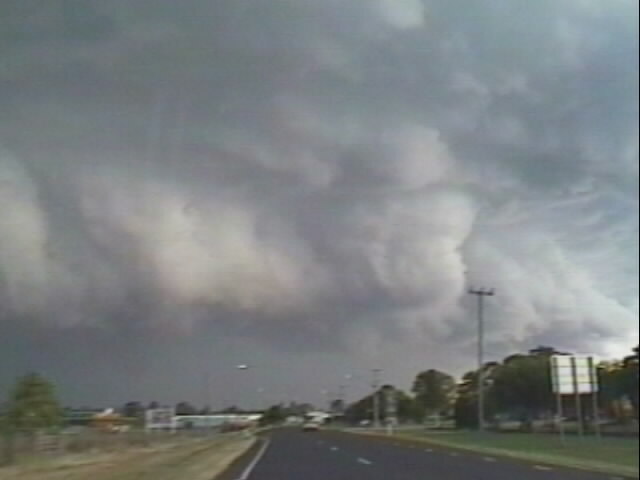 While also at Tregeagle, Matthew Pearce phoned in to suggest a very strong cell was west of Grafton heading northeast. Great news! And it was showing as "red" on the radar. Should we head south to intercept this NE moving storm, or west to remain west of the NW flank? After driving a few kilometres it was obvious the cell was spreading towards the north so we headed W to Parrots Nest, a lookout southwest of Lismore. 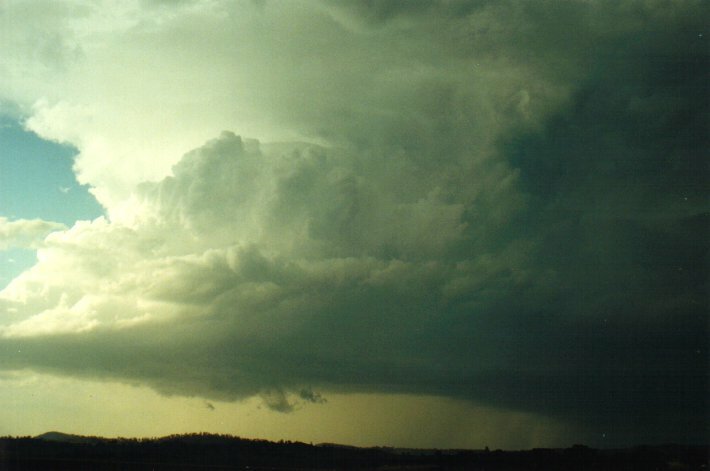 Here we watched as this storm evolved into the monster HP supercell. Some base features were evident from our elevated position but it was still about 30 kilometres or more south of Casino (40km from us) so hard to pick out, although I did observe one funnel shaped protrusion for a few moments. Meanwhile the cell to our NW was continuing to develop and seemed to be a lot closer than it should have been if it was heading NE ??? This did not really sink in till a bit later, but we took some photos of its development. It was now decision time again - should we stay put or head west. It was an obvious choice in the end as the precipitation from the HP was heading our way, and I wanted to stay west or north of the storm's NW flank. 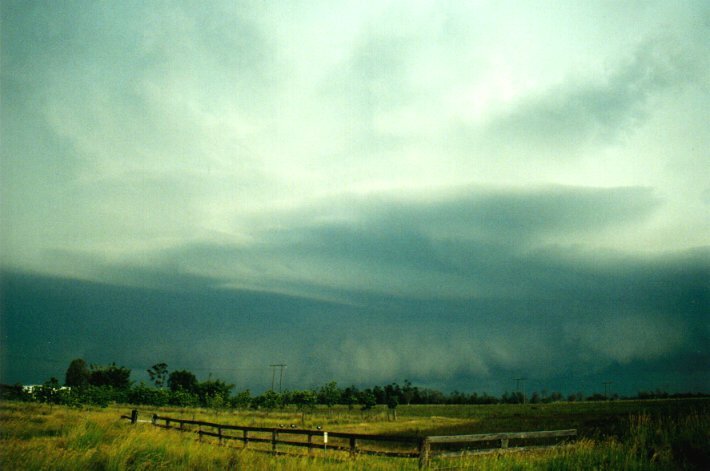 The HP had by now grown into one of the largest storm structures I've ever witnessed, it must have had precipitation over 50 kilometres west to east and was pushing up to 18km in height. 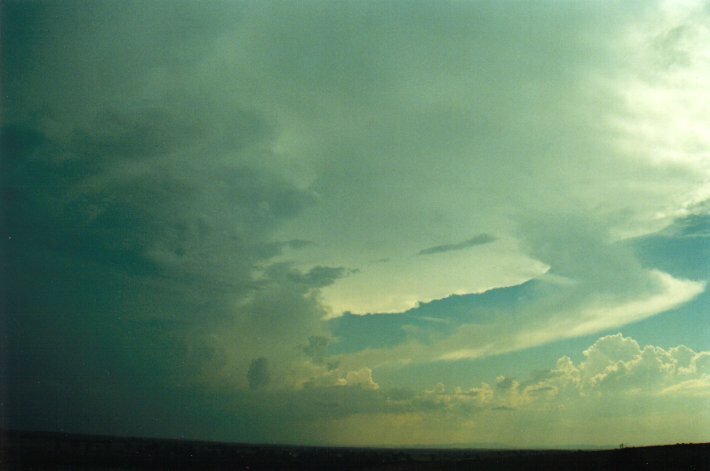 The anvil was thick and spread out overhead in an ominous arc towards the northeast. 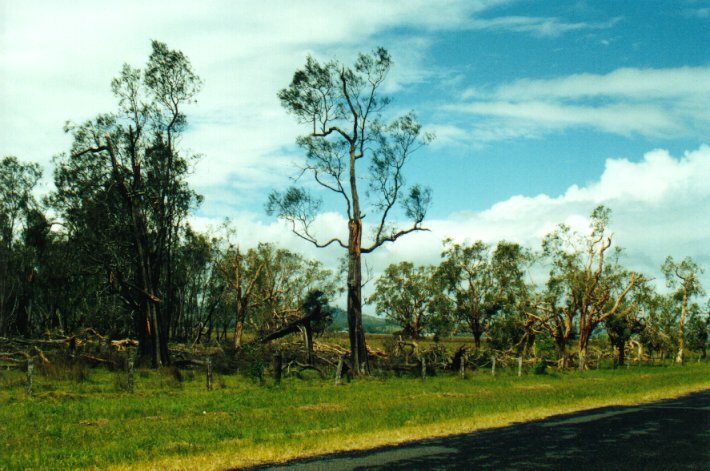 We raced west along the Bruxner Highway towards Casino, planning to keep going but were "encouraged" to stop sooner (about 12ks E of Casino at Fig Tree Lane) by what was developing to our northwest. The storm there had definitely moved towards us in a ESE direction and was now exhibiting a wall cloud structure on its southwest flank! I couldn't believe this thing was moving in a direction so different to the HP (about 120 degrees different), but it was quickly confirmed when Jonty Hall called in from the Brisbane BoM asking for observations. 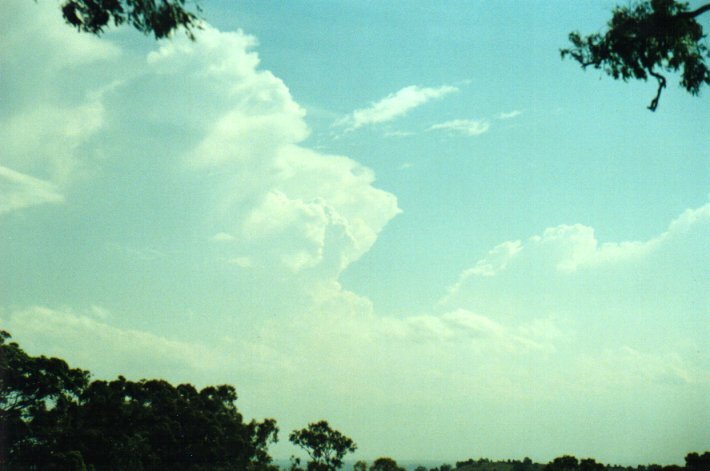 He said the cell we watched develop west of Kyogle had split into two, the left mover (as viewed from behind) tracking N into the Border Ranges and the right mover (traditionally the weaker) heading ESE. I confirmed that we were "between supercells", the HP to the south and the LP or Classic (yet to be decided) to the north. This observation assisted in the QLD BoM issueing a Severe Thunderstorm Warning. Meanwhile the beast was approaching from the south and it's eerie base structure came into view out of the haze. As the terrain we were on is only about 20 metres above sea level it took a while before the features were visible, although little if any trees are in this location. 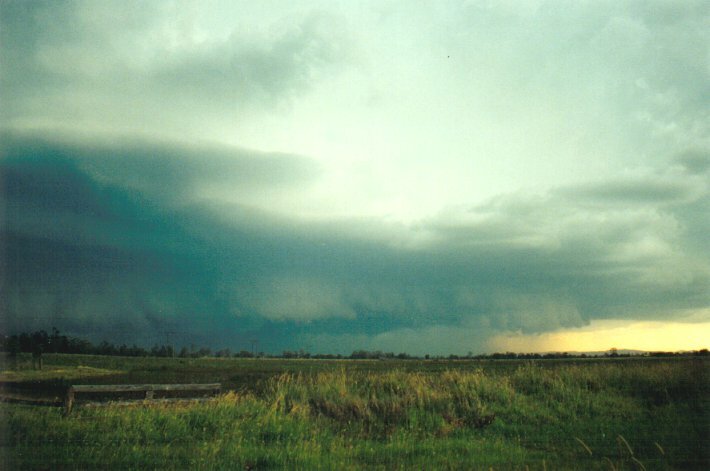 HP Supercell moves in from the south. On my God ! 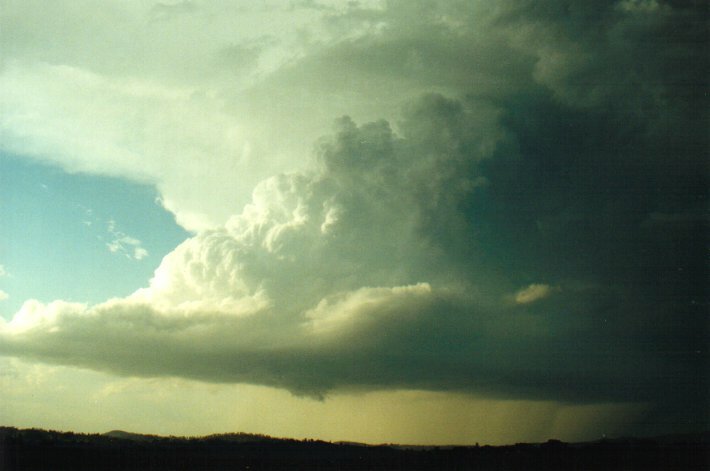 What have we here - a Classic or LP Supercell !!!!!! This cell to our north was such an incredible structure and something I have not witnessed before. 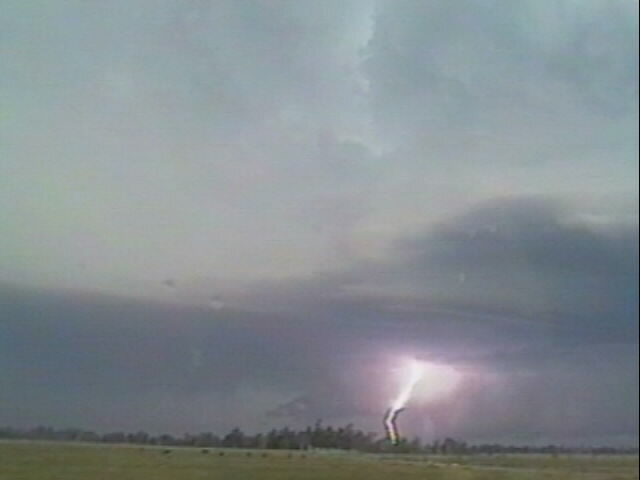 You can see the corkscrew updraft and easily imagine the rotation. The wall cloud persisted the whole time we observed this storm, with some precipitation well off to the NE, but little lightning was seen. My big mistake this day was stay too long in this location watching this awesome structure, because the real beast was quickly approaching. Lightning was frequent and becoming quite close as the HP came up from the south. 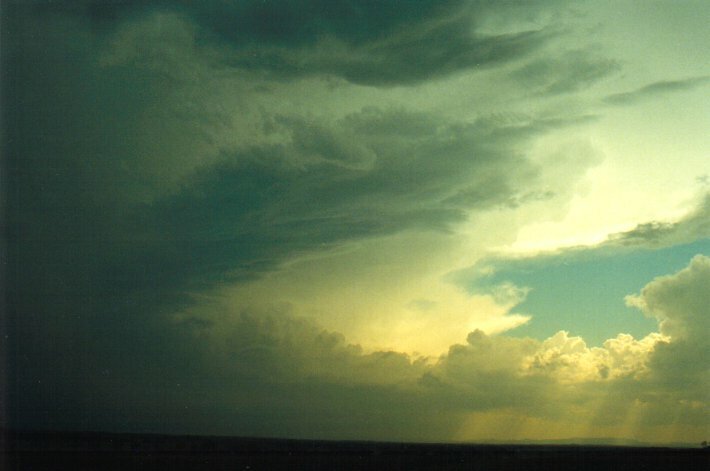 The precipitation appeared very intense and a green tinge was apparent above the developing gust front. We took off westwards with me now realising we were unlikely to be able to get out of the storm as it was rapidly approaching Casino. A one minute stop to take these pics at 6pm, then we were off again, the third picture here showing the collapse of the other supercell which was to our north. The scene to our south was truly amazing and something I've never seen on this scale before. We had the video camera going and some captures will be added here shortly, but for now you'll have to imagine it from my description. 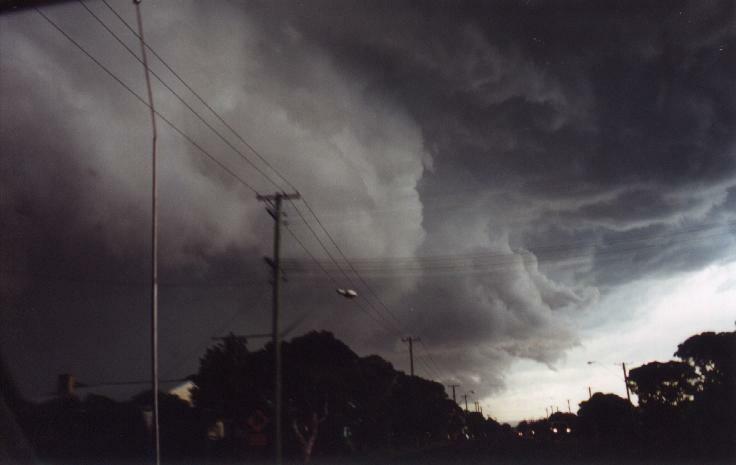 Along a five to ten kilometre east west line was the most spectacular gust front formation - the clouds were boiling and swirling with areas reaching almost to the ground. Intense CGs punched through this. And it was so dark at the base it was very obvious this was full of hail and going to cause huge damage in the town. 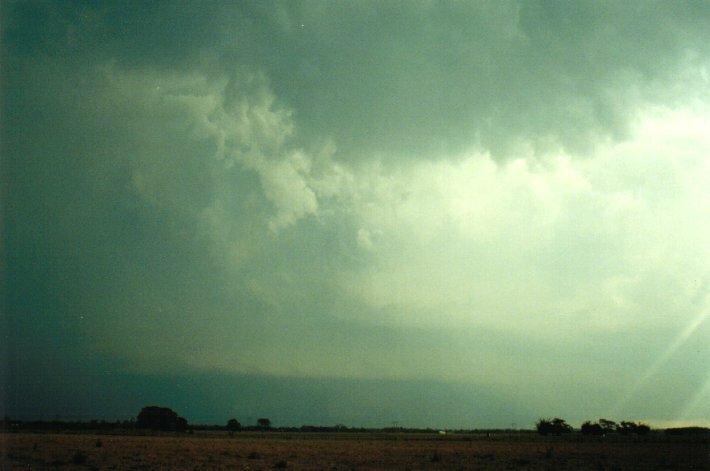 Out towards the northeast was a huge "beaver tail" type inflow band and where it reached the gust front was a prong lowering pointing downwards to the NE. Further west along the front was the incredibly contrasted boiling guster, appearing white on the leading edge and black behind it. These 3 photos were taken just as we reached town while speeding through! 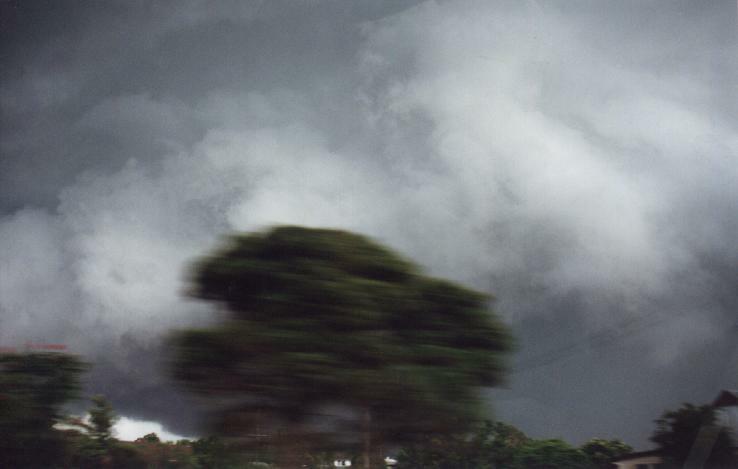 Soon after we passed the Bruxner Highway / Summerland Way intersection it hit. Immediately trees bent over, dust and debris went flying across the roads and we were splatted with the first rain. I drove as quickly as possible (in a 60km/h zone) with the road heading W, NW and N on the northwest outskirts of Casino. It was now 6.10pm. 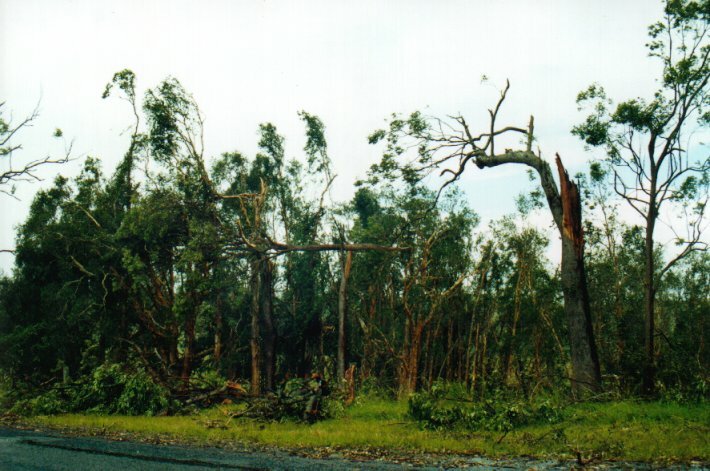 Larger branches began flying off gum trees in front of us with one hitting the back of the car (causing a large dent). Intense bursts of rain with winds to about 120km/h hit from the S and SSW. We kept travelling N up the Summerland Way but the storm was too quick and we could not escape the fury. Having to slow down because of the poor driving conditions did not help. 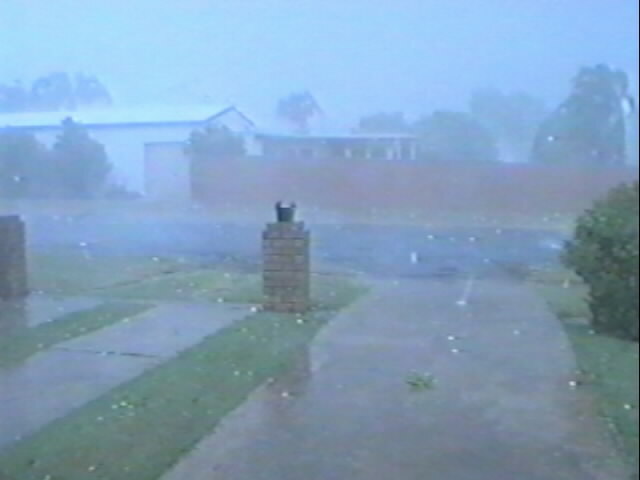 About 4 km up the road the first hail hit, probably 1-2cm diameter maximum at this stage but soon it became much larger. We stopped in a side road clear from trees as the storm entered an intense phase over us. Winds were whipping through from the S-SSW at around 120-130 km/h, intense bursts of rain gave white out conditions and then the larger hail hit. 4 to 5 cm stones pummelled the car, and being wind driven it was a real worry a window would break if larger stones fell. We endured the onslught for what seemed like ages before deciding to head back south towards Casino, hoping to get out of the violent weather sooner. 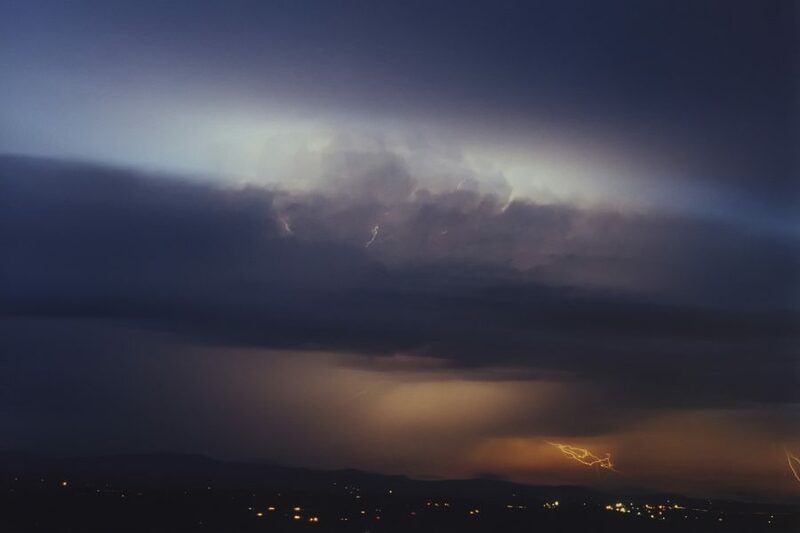 There had been a brief lull, but as the winds tended SE then right around to the NE, more violent wind gusts with blinding rain and hail hit from the rear downdraft. We stopped again a few times on the side of the Highway waiting it out. About 6.25pm it finally eased and we headed into town to see what had happened. 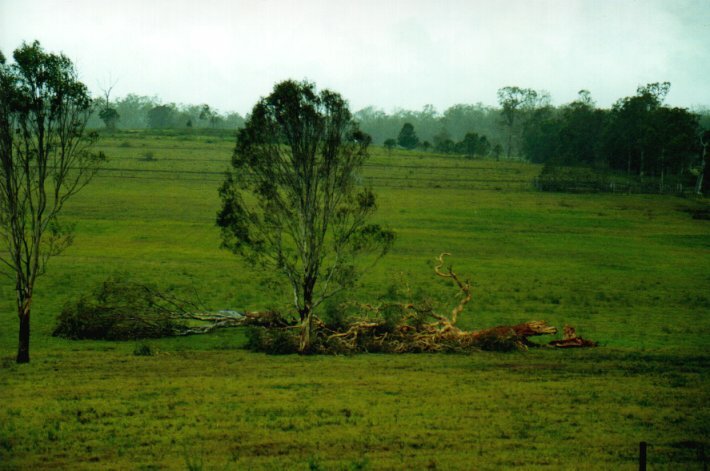 Large trees were down, branches and leaves strewn across the roads, roofs were off or damaged, windows smashed, cars dented, the power was off, and everywhere large hailstones were lying on the grass. We stopped to collect and measure a few and the largest stones: 6cm diameter. The official BoM observer measured one at 9cm diameter ! It seems we were outside the main damage path. My car has plenty of dents but only from the 4-5cm stones thankfully. 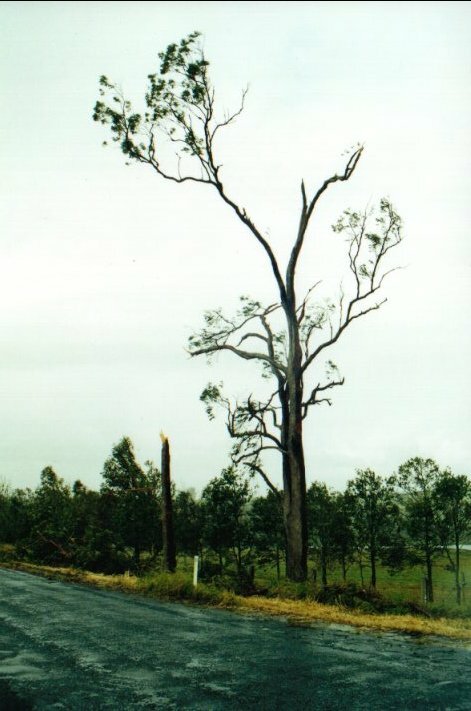 Some more tree damage photographed 2 days after the storm. Shortly after arriving home at McLeans Ridges, northeast of Lismore a lovely line of congestus sprung up on the hills to my north. It became quite lightning active. In the meantime another very large storm complex was advancing up the coast from the south. 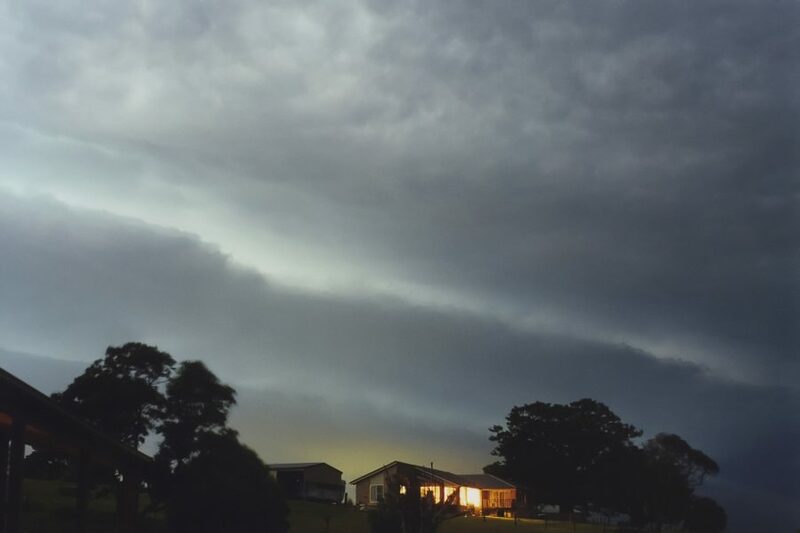 Radar revealed some intense cells imbedded in an east west line stretching several hundred kilometres on the North Coast and Northern Tablelands, with the most intense echos along the coast. Lightning was occurring multiple times per second as the system advanced to my location hitting shortly after 9pm. 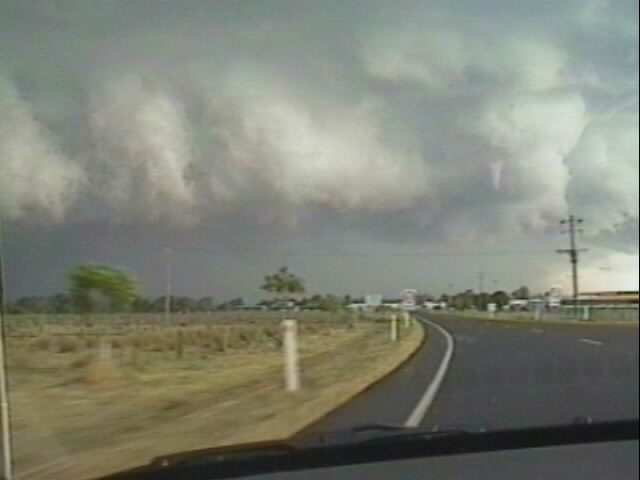 It then continued into SE Queensland. Radar From Bureau of Meteorology. 6.10pm local time (click for larger view). The Grafton radar was unfortunately knocked out at 4.50pm local time. The Grafton loops show all development leading up to a supercell signature just west of Grafton by 4.30pm local (0530z) and the start of the splitting storm NW of Casino at 4.50pm local (0550z). 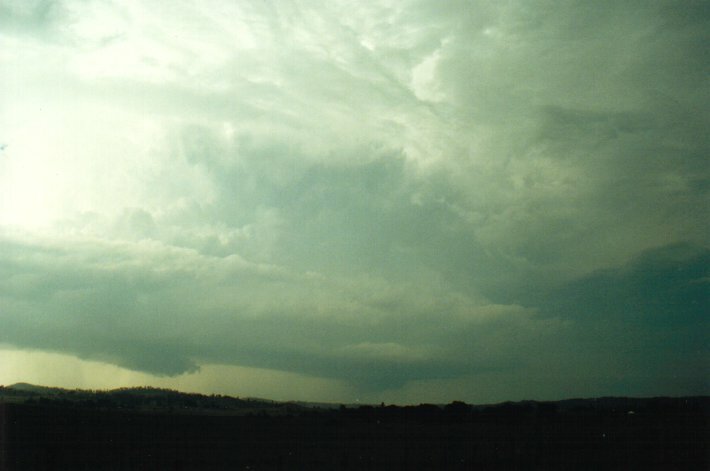 The Brisbane local loop shows the splitting supercell from W of Kyogle and the Casino supercell just after it passed through the town. 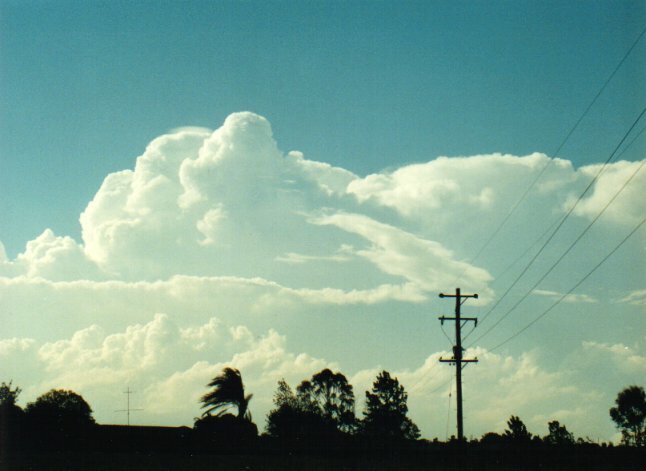 Check the broad scale Brisbane loops for the big picture and all the others storms occurring. The colour bars on the images represent % of strokes in 10 minute intervals from the time shown (top left of each image), starting with gray. Each screen is 1 hour. This gives an indication of storm building, steady or decline. Click the image for access to a sequence from 4.00pm to 12 midnight 17/1/2001 (local time). Satellite Images From Bureau of Meteorology. MSL Analysis Charts From Bureau of Meteorology. I am a resident of Casino. Wow what a storm - I have never have I experienced anything like it. I was on duty at my place of work (Woolworths). I went outside to check what was about to hit as we had a power flicker that was about 6.10 and I could not believe what I saw. The storm front was very close and it had these whiter coloured clouds coming from under the storm and being sucked up the face in huge updrafts. I have never seen anything like it. It was at this point I guessed we were in for big hail. I am no expert but I could see there was a lot of air moving straight up the front of this storm which was not good. Then the wind hit. We have colourbond walls on our loading dock that know look like a bomb has gone off showering it with shrapnel. The bosses car has hail damage so big you can sit cricketballs in the dents. I have hail here at home in the freezer that measure 10 cm across with holes in my roof to prove it. After a nice day of fishing at Ballina with plenty of fish caught we arrived home 5.45pm, the kids started to clean the fish while I put things away and my husband started to do the greyhounds. In the distant were storm clouds that seemed quite normal looking. Thinking that they would just past over like they normally do when you need rain I went to have a shower then a coffee while huband had his shower before going to pick up our little daughter from his mothers place were I have got my horse. While my husband was in still in the shower the clouds started to loom over, big and black they got lower and lower and started to swirl around. The hail started the size of tennis balls, wind started picking up, husband still in shower, our big garden shed started rocking with the wind, I panic and scream to hubby to get out of the shower quickly. My husband then runs up to the shed to try and hold it down but the wind just kept getting stronger and too dangerous, so he came back down to the house. Not long after the shed blew over and crashed into the gate which in turn broke off its hinges. Then the roofs started to come off the two small dog kennels, husband runs up to get one of the dogs. Now I had my husband, three boys, one retired greyhound and one racing greyhound all huddled in the kitchen watching the wind and hail destroy my backyard. Next the hail decided to smash three of my front windows with a big explosion. While this was happening another racing dog came running down to the back door so I opened the door to quickly let him in and panicing he ran through the glass that blew into the dining room. One dog was still left up the back but we thought that he would be safe as his big kennel was made out of steel and was very heavy, but not to be, my husband looked out of the kitchen window while I was holding the three dogs to try to comfort them and the children, when he saw the kennel lift like a helicopter. The next thing a yellow/brown haze came over and you couldn't see anything. When things started to ease we found the kennel in a backyard a few doors up and started to panic about the dog thinking that he would be injured or even dead. Next thing when we all went out the back the dog trotted out from around the side all wet and shaking with fright so that was one relief. We had our budgie aviary blow over and we lost most of them bar five, others flew away or died. The roof blew off they chook cage but they were fine just wet and unhappy. The Car's windscreen cracked in a few places by the hail stones and a few dents but it still seems happy. 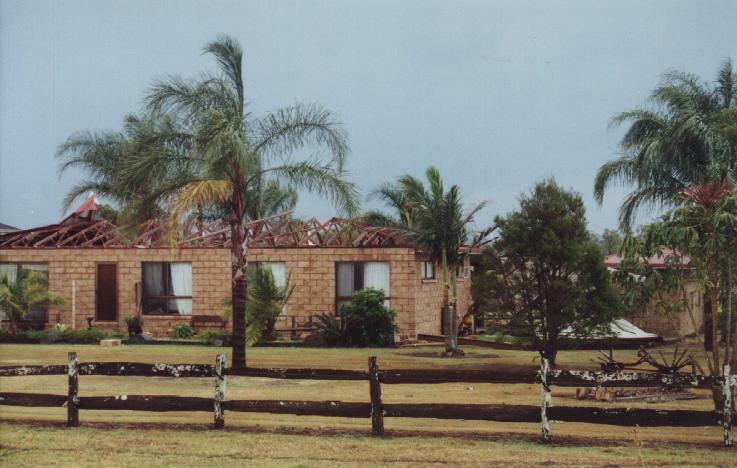 We looked around town the next day and we can be thankful for our bit of damage as other people had their roofs taken right off their houses. The town was a big mess with all the tin and wood laying around and smashed windows. 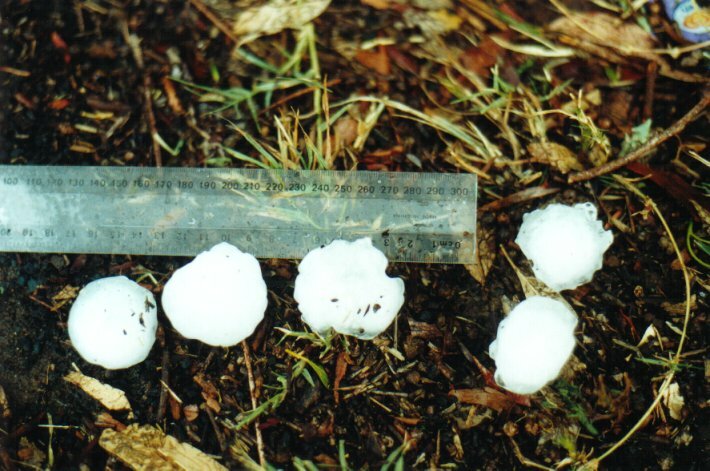 At Copmanhurst (~15 km northeast of Grafton), we had 'cricket balls' for hailstones (one weighed 69 grams), for 15 minutes from about 5pm. It was preceded by rain the total of which was 17mm. 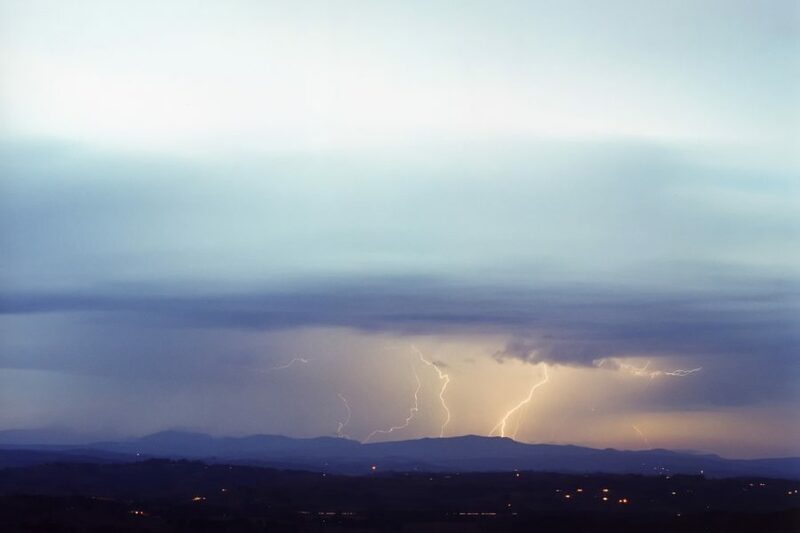 After the rain and hail ceased (thought the storm was over), we had a thunderclap that felt directly overhead, accompanied by a lightning strike about 50 metres from the house. A little more rain followed briefly. We got the second storm at about 7.45pm and there was hail in it here, (about golf ball size) and a further 23 mm of very fast and heavy rain, driven almost horizontal by a very strong easterly wind. Closing the door against it was a struggle, and it felt like windows would break with the pelting of hail. 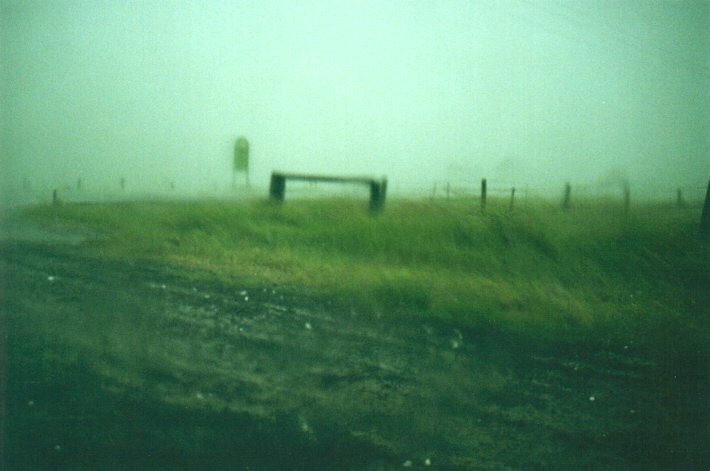 Visibility was zero, rain & hail was so thick. 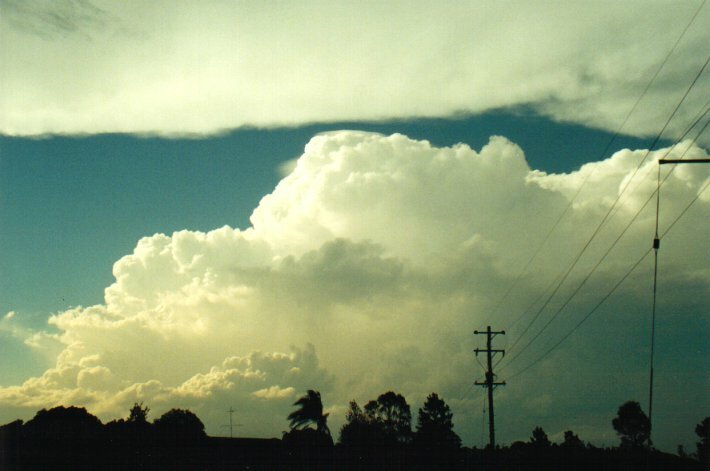 On the day of the storm I was staying at my son's house at Ellengowan south of Casino, and at times was viewing the storms all around!!! At one time in the evening, and now unfortunately I cannot remember the time, whilst looking north towards Casino and the Border Ranges I suddenly noticed in (or on?) a huge dark storm cloud, a glow - orange red in colour, which slowly pulsed as I watched, increasing and decreasing in intensity. I watched for at least a minute, and do not know how long it had been doing this before I saw it. 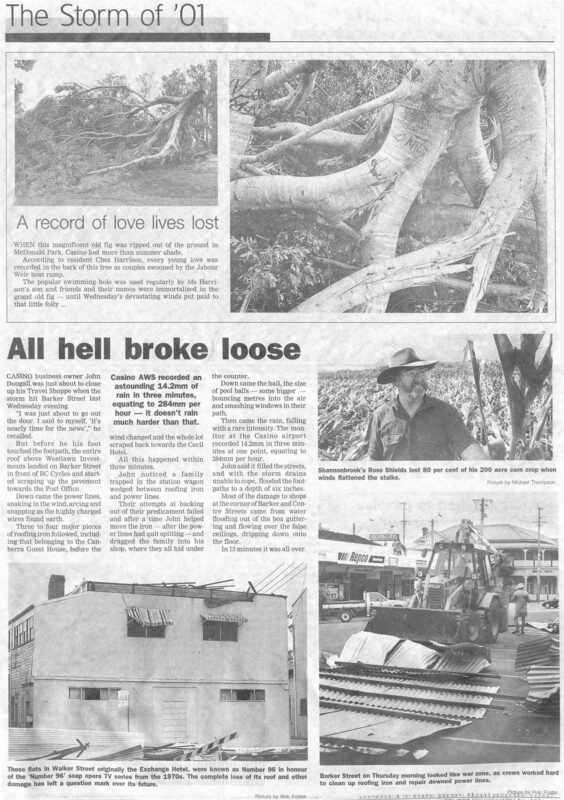 I had adrenalin rushes driving home from Lismore that afternoon trying to beat it to Casino to get my car under cover. But the adrenalin soon changed to fear when it hit and I watched the roof being peeled from my Grandmothers roof (I live three doors away form her) and then hearing her screaming and crying when I could finally get to her. I was spending the day in Lismore and as usual it was hot. That morning there was some cirrus and I was hoping that this would clear in case we were to get any storms so as I could have a good view of them. I was inside for the morning and when I went out around noon the cirrus had cleared and replaced by cumulus. 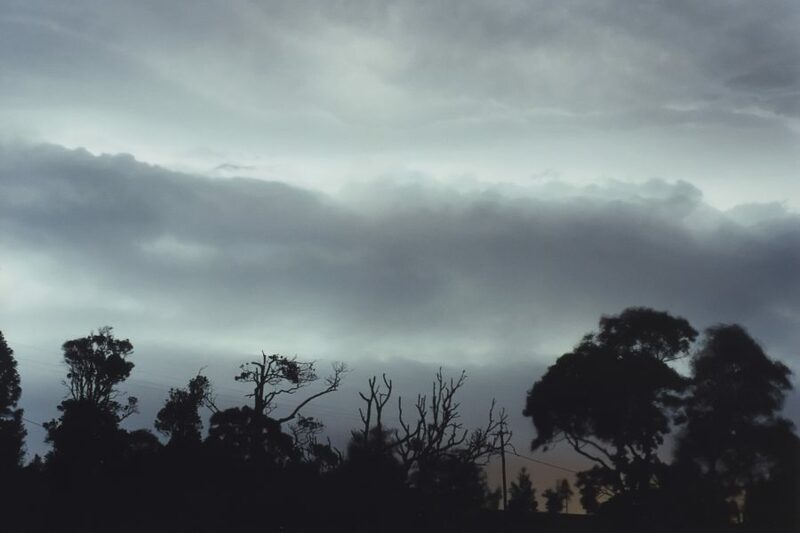 During the afternoon I glanced at the sky at times and saw nothing unusual. However I so happened to be walking past a shop at the right time only to hear on the radio for people to put their cars under shelter and this told me that a severe thunderstorm warning had been issued. At around 4pm I went over to South Lismore and to the distant south there it was. A thunderhead spanning to the SE with a large boiling and developing cumulonimbus to the S but nothing that I could see to the west. Again I was inside for about an hour so I missed the approach. At around 5pm on venturing outside a huge thunderhead spread overhead and to the S. At this time there were faint rumblings. 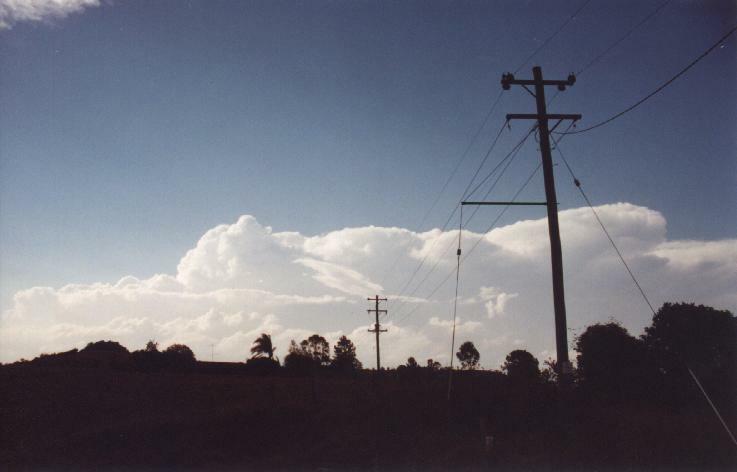 We were heading back out to Alstonville and I noticed that the storm actually spanned E /W and what I was looking at was the main thunderhead because when we arrived home I could see the southern side of the storm. At this stage there was a good bit of thunder mainly to the W. I concluded that the heart of the storm was W of Lismore. Incidentally there was another cell that was boiling to the W earlier and appeared to start to merge with the thunderhead but this must have decayed. However the main storm passed over with heavy rain for about half an hour and was moving more to the NE where we missed the heart of it. 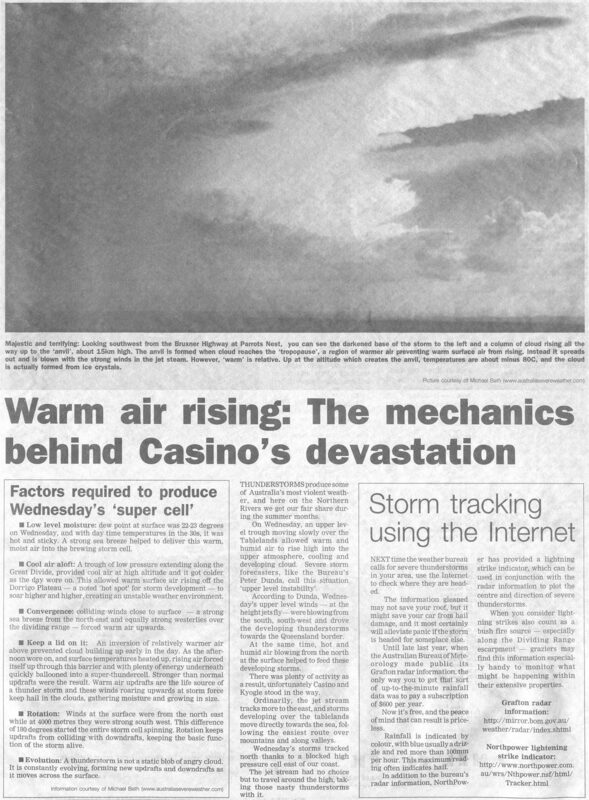 This I believe was the storm that wrecked Casino at around 6pm. On the radio there was a lot of static and virtually continuos. The storm passed and thunder was less and the sun came out for a brief time. 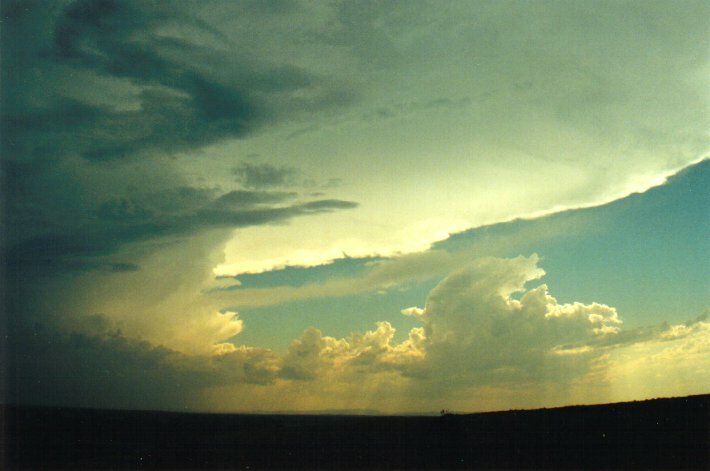 The second storm appeared to the distant SW at around 7pm or around that time. Lightning static was still quite strong and it is difficult as to know which storm the noise is coming from. Nearer to 8pm the lightning show started to the SW. Now before the storm hit we had lightning out to sea, to the NW, to the S, and the approaching storm to the WSW. Lightning was very regular. The storm hit us between 8:30 and 9pm. I saw one CG in a perfect spot right between trees to the W that were blocking my view of course I was inside and there were other CG's I would imagine because there were a few good cracks of thunder. 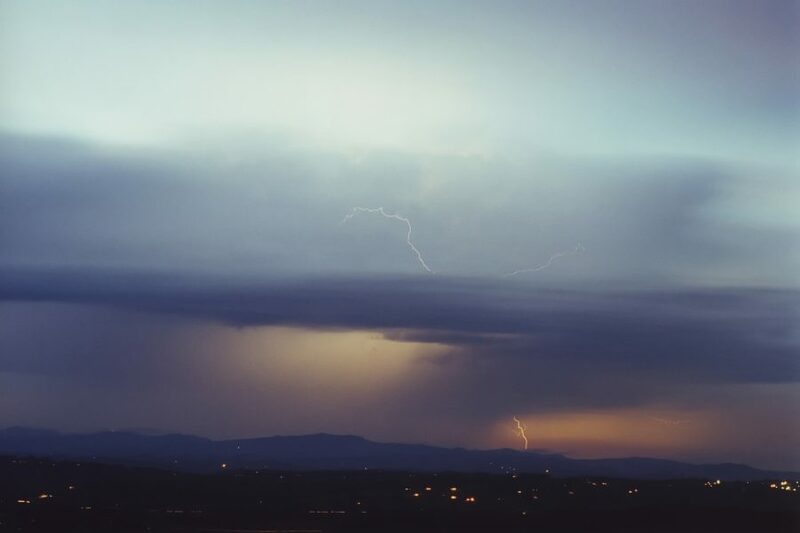 We had heavy rain and didn't notice any hail and the wind was fresh from the S. The storm had nearly gone by around 10pm leaving lightning flashing to the NW. After I thought it safe to turn on the computer I thought I would try and log on and check out the tracker and radar but to my frustration I wasn't able to get online. It was a quiet night. We had 29mm out of those events. At around 6am the next morning there was some thunder. When I got up later I saw a cell to the distant NW and the radio still had quite a bit of static but not as much as last night. The static seemed to remain through most of the day but seemed to become less quickly during the afternoon where I was hoping for more build up. However the atmosphere felt different and so lessened the chance of storms. Late that morning there was some build up to the SW and I heard one rumble. 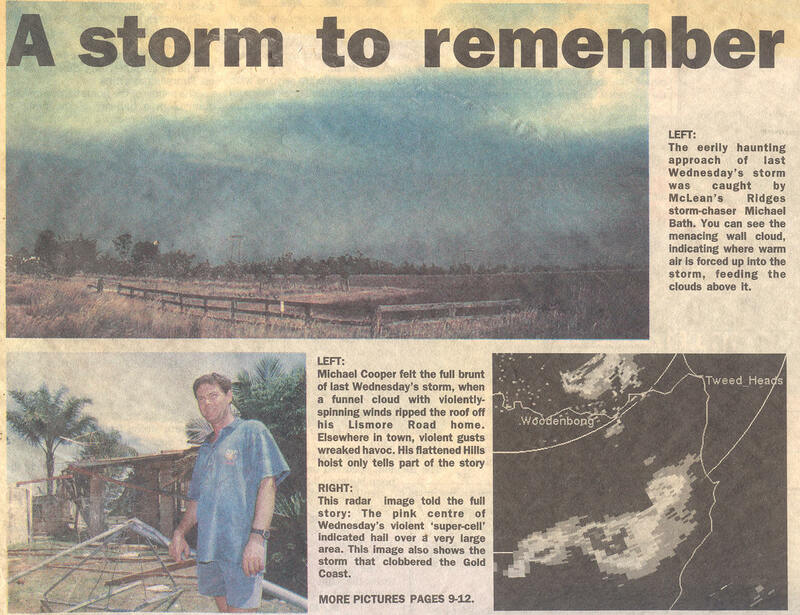 The tracker and radar that morning indicated that the activity was moving up into SE QLD and off the coast. I heard that the Gold coast was experiencing a storm that morning. The chart saw a low form off the coast as was forecast and this seemed to move more north. The cloud chart had a bit of a swirl in that area but nothing developed. It must have been pretty frightening chasing it but kind of exciting at the same time if you know what I mean. There hasn't really been much talk about it being a tornado just a mini cyclone because of the wind and that it didn't leave the path of a tornado just a cyclone and only a mini one at that. 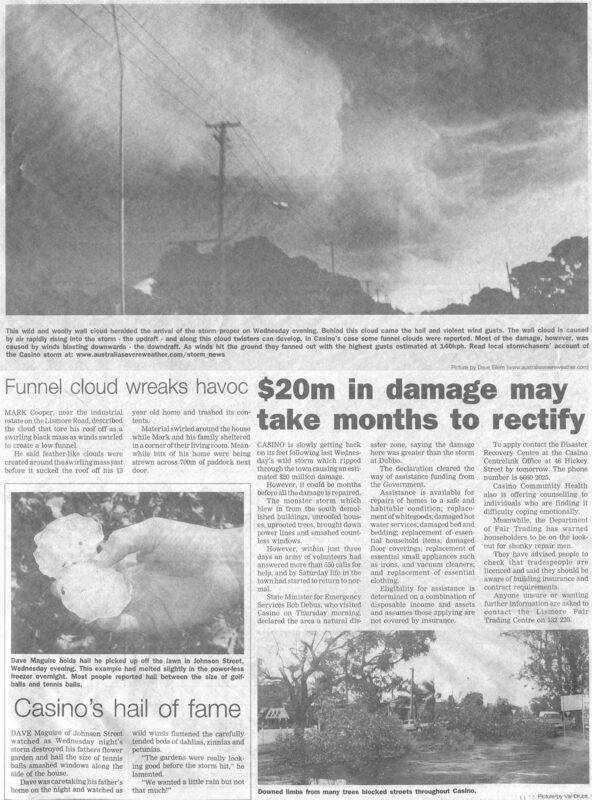 But in the paper it said people had had sightings of funnels I did have some hail but it was unfrozen during the night because of the black out. The hail was pretty bad like you could see it falling and you could just hear it thudding on the roof. We were (my parents and I) standing outside looking at the sky which was a nearly black colour though I didn't really see any green to indicate the hail and it was coming from the south from my memory and were standing out there and the storm looked a fair way away and we just barely got inside before it hit. It hit thick and fast - you could see the hail falling to the ground and the sound on the roof was just bang bang bang as the hail hit and one after another 3 windows smashed and even though the windows were shut the water was still coming through. It went on for a while just this heavy raining and hail yet not all that much lightning or thunder. I was looking outside but you couldn't see anything because the rain and winds were so strong, you could see the trees swaying. It stoped and I went outside to check where our car was parked and it was parked along with 5 cars - every one of them got their windscreen smashed. And then it began again coming from the east - I don't know if that was the eye or the storm or what (I have researched storms a bit in school) and people have said that two storms hit each other and from what I can remember if two winds or storms meet then that is what causes a tornado or cyclone. The winds were the same and hail was just as big as we drove home with no side window and a cracked windscreen, we crossed our fingers that our house would be fine. Down town the main street was blocked off and we drove past houses with no roofs, I think pretty much every house in our street got broken windows or worse. Also I think that there has been a lot of exaggeration but still it was pretty bad but no as bad as some people are making out. 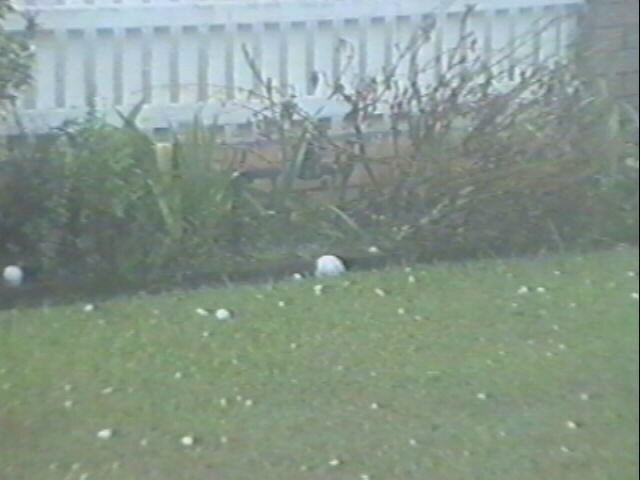 The hail when it came down was fairly big but when it hit the ground it broke up. I was at the Uniting Church when it actually happened in main or central Casino but I actually live in the south and by the sounds of things they got it worse over here. From what I have heard and seen there was a garden shed across the road and a house behind and it just went flying through the air onto the road and from what the neighbour across the road from us has said is that he looked outside and there was a whirly wind kind of thing. I can't verify this though as I did not see it. I reside on the south side of Casino, 300 metres from the river. My location is slightly elevated and I have a pretty clear view over the town of Casino. My wife drew my attention to very black clouds approaching from just west of south. I was expecting a storm but as there was no green hue I was not expecting hail. I noticed that the clouds above seemed to be slowly swirling in a clockwise direction. 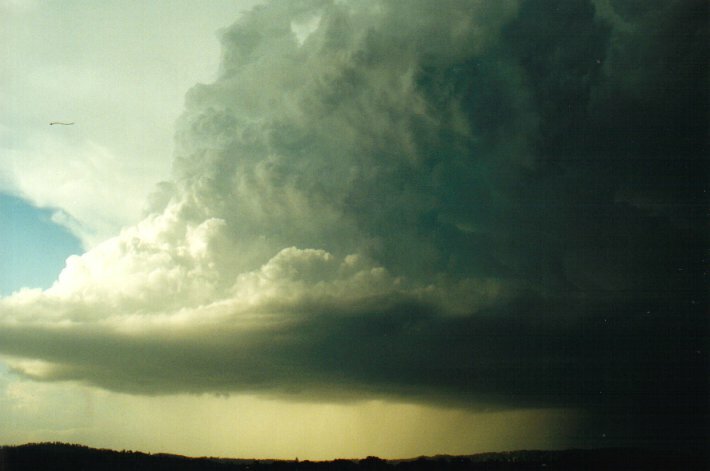 Within seconds the wind blew violently from the east of south and brought with it hailstones the size of a man's fist. 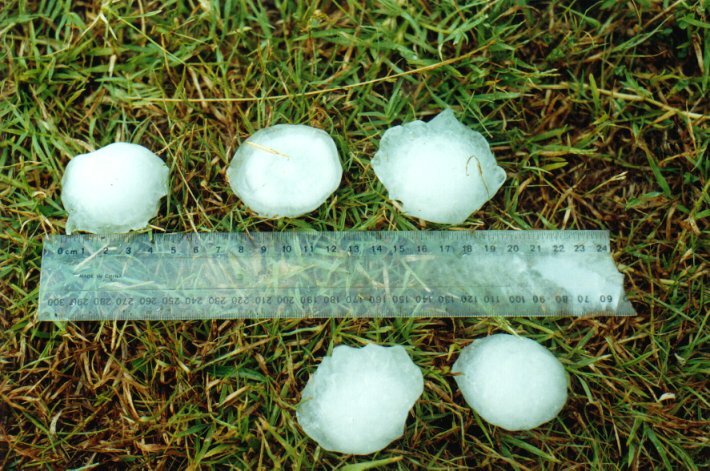 Some of the hail had fused together making larger irregular stones formed of many smaller stones. The large stones were not evenly distributed, some fell within centimetres of each other, the next may have been metres away. 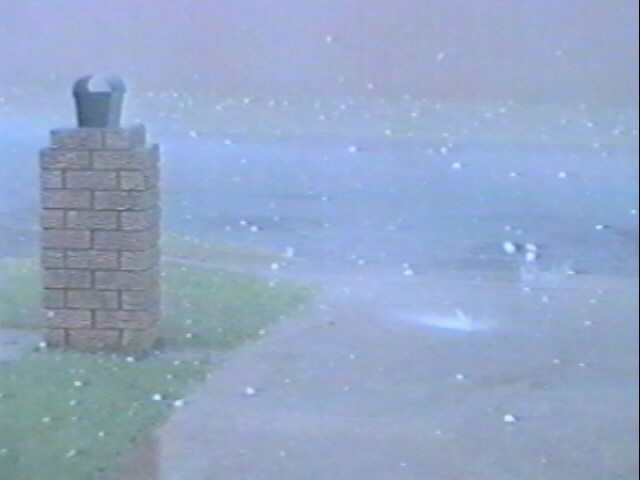 Light, evenly distributed smaller hail also fell for a period of seven minutes. (seemed like hours). The wind ceased and within thirty seconds started to blow from the northeast accompanied by smaller hail, for a short period. (time unknown as I was attending to my frightened family). 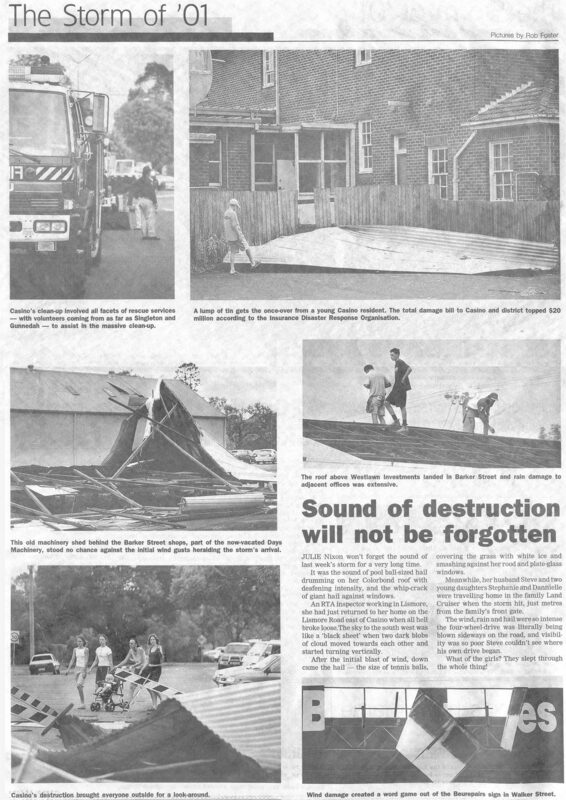 During the time that the wind was coming from the southerly direction I was observing debris blowing from buildings and landing some 200 metres away. At no time did I see anything resembling funnels, as some people reported. 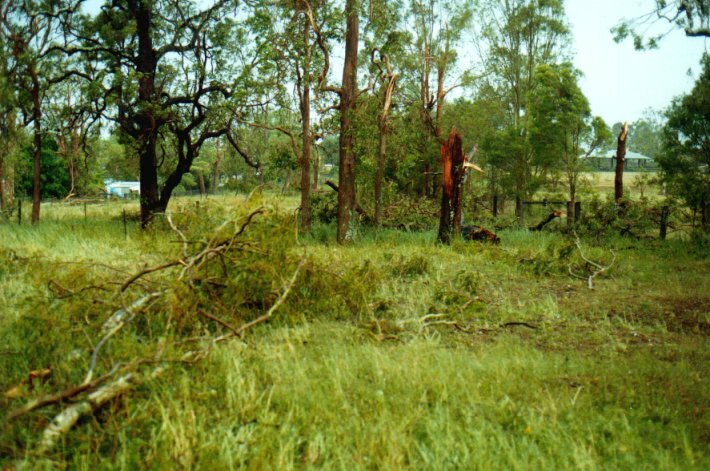 On inspecting friends property all the trees lay on the ground in the same direction, all the debris blew and landed the same way. There was no evidence to me that it could have been a tornado as the destruction seemed to be at random, there was no path of destruction as would have been with a tornado. The properties that received the most carnage were unprotected, eg. open spaces, north side of streets and waste lands. Thanks to Anthony Cornelius for achiving and sending me the radar, and to Matthew Pearce and Jonty Hall for updates in the field.